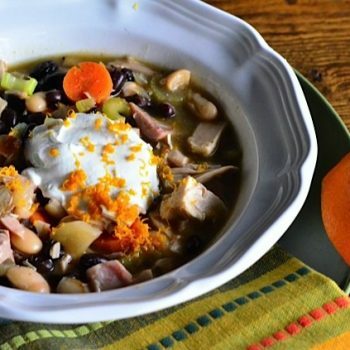 This Bush’s Beans One-Pot Citrus Chicken Chili recipe has a zest of orange, and delicious sweet and savory flavor to enjoy for a weeknight meal! 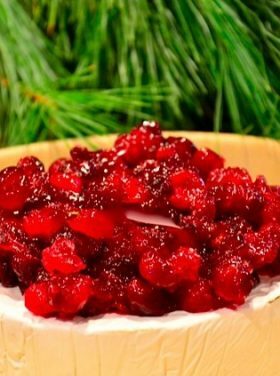 It’s ideal for this gorgeous time of year, it uses ingredients that you should have stocked in your pantry (I always stock different varieties of Bush’s Beans) and fridge, with a quick stop off to the grocery store for a rotisserie chicken, a fresh orange and herbs. Speaking of spices, I’ve learned the most about spices from my good friend and chef, Jeffrey Saad, as we’ve attended several Bush’s Beans culinary retreats together. Jeffrey says “grind your spices for a bolder flavor,” which I agree with, but he also shared the philosophy that if you’re in a hurry, and need something quick, dry spices will work just fine! Jeffrey brings it all home with his cooking. BTW, Do you have his new cookbook Jeffrey Saad’s Global Kitchen: Recipes Without Borders and have you watched his TV show United Tastes of America. Tuesdays at 10pm ET on Cooking Channel? He can take the simplest recipes ideas, like basic chili, and give some great tips that turns it to gold. This one paragraph, in his new book, reached out and grabbed my heart. It says a lot about his philosophy regarding cooking food, and hospitality. The most important tool in your kitchen is your heart. I love how food connects our family. When my boys come home from college, it’s all about the food. :) So these kind of one-pot meal recipes–ones that can be cooked in 45 minutes with simple ingredients–are a dream. Quick and easy! I think this one-pot meal, soon to be another Coughlin family favorite, might become one of yours too! 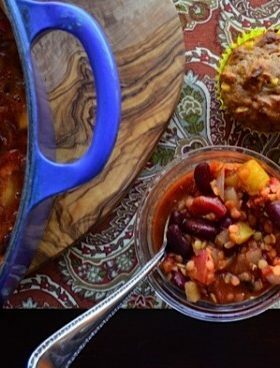 What’s the most unique ingredient you’ve added to a chili recipe? 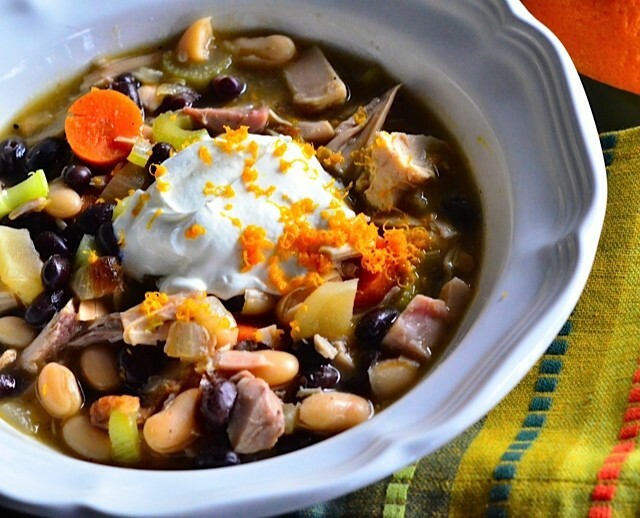 Easy one-pot meal with Bush’s Beans, rotisserie chicken, and citrus flavors. In a large frying pan, cook onions, celery, and carrots in hot oil until tender. Stir in ginger, cumin, salt, and cayenne pepper. Add in chicken, broth, salsa verde, and drained beans. Bring to boiling; reduce heat. Zest the orange; set aside the zest. Squeeze the juice from the orange in a separate bowl. Add the juice of the orange to the chili mixture, stirring well. 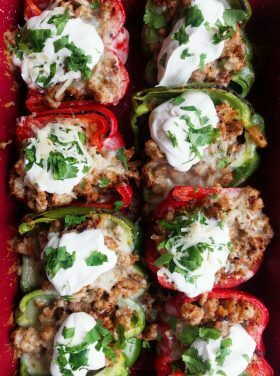 Top with sour cream, orange zest, and finely chopped cilantro. Serve. 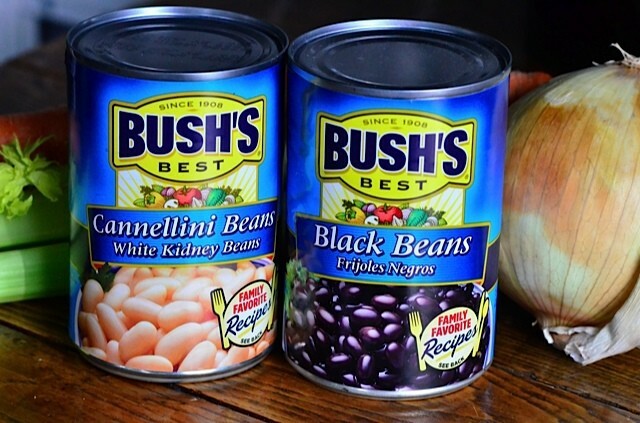 I have a paid partnership with Bush’s Beans, but as always in this post today, all opinions are my own. Oh, I’m going to have to try this. I also used Bush’s beans in my chili last week, so I know it’s a great brand with good quality! I like the citrus in there – nice play on flavors. Of course, I’ll have to find a wine that works well. I have one or two in mind! As for the comment above, I understand her point. However, there is a ridiculous amount of time and effort that goes into running a blog. And then, there’s the money. None of it’s free. The hosting isnt free, the ingredients aren’t free. And …. you know what – that needs to be a blog post… My point is – writers are entitled to find products they love and sponsor them. And if Diane thinks that is out of the ordinary, go watch Martha, Paula or Emeril and see how many product placements are on the show, plus the commercials in between. Again, I respect her comment, but it’s a ton of work to do this stuff. Thanks, Matt. I agree … I just commented on Sommer’s post above. I love all my food blogging friends and I SO appreciate their hard work. Interesting how some people can be so negative. This looks delish! Will be pinning for later. Sandy, I love how you jazzed up this chili!! Especially great in the normally dreary months of winter, this one has a hint of sunshine in it! I love Jeffrey, Bush’s and YOU! 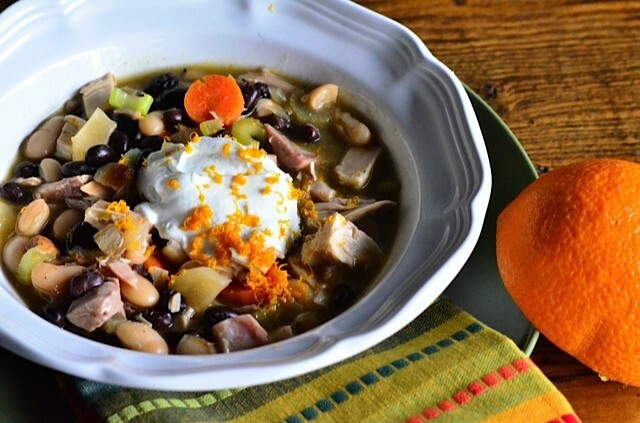 And I love the idea of tangy citrus chili!! I don’t think people realize just how much: time, money, creative energy, blood, sweat and tears go into producing every single blog post. If a bloggers loves a company/product and that company wants to help support what the blogger is doing, I think that is a GREAT thing. Keep up the good work Sandy! People don’t have a clue. They want the free ideas and recipes. I really only want readers here at RE who want to be here. No obligation! Blogging has changed the world in many ways, and I’m happy to be a part of it. I love the brands I work with and only write about the ones I use or believe in. Yay. I used to love your blog but it seems like it’s nothing more than paid advertisments in every new post now. I liked it when you were more real with your entertaining tips, recipes & Balcony girls stories. Please go back to your roots and stop being a paid spokesperson for every brand under the sun.